How to make a birch bark ring, a dollar bill ring and an orgami Peace Symbol ring . . . Here are a few links to some sweet and simple methods of crafting rings from birch bark and paper, as well as the old depression era craft of creating a ring from a dollar bill. These will only make temporary rings of course, but they are fun to make and their presentation would no doubt be memorable and romantic. Here's a link to making a heart shaped ring from a dollar bill (or any bill sized piece of paper) Hand made paper, magazine pages or your own art work could be used in this manner. Try searching instructibles or DIY sites for lots of great ideas on how to make your own rings from all sorts of different materials. 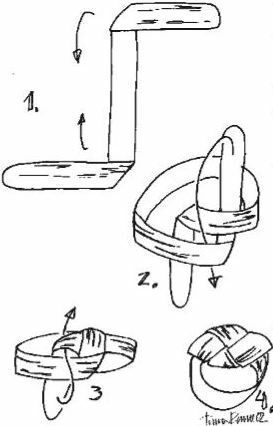 A simple method of constructing a ring from birch bark. The sketch is fairly self explanatory. There is a very old Finnish tradition of becoming engaged with a birch bark ring! This traditional Finnish song was sent to us by a fellow in the USA who commissioned one of our birch wood and birch bark rings for his fiancee. Heisuli hei, minun lauluni soi, oonhan kulkuri huoleton hulivili! Viimeiset lanttinsa taa poika joi, eihan rikkaana elaa voi. Mina tuohesta kultaisen sormuksen tein,silla kihlaan heilin itsellein. Tama tuohinen sormus ja lempeni vaan, kestaa yhden illan kerrallaan. Here is the 'rough translation' of the song he offered us. Heisuli hei, my song sings, I am a trouble free vagabond rascal! This boy drank his last coins, one cannot live rich. I made a golden ring out of birch bark, I will engage a girl for myself. 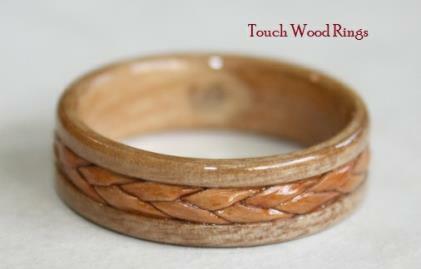 This birch bark ring and my love lasts one night at a time. You may also enjoy visiting our Wood Ring Blog where you will see more examples of David's hand crafted wooden rings and some stories and letters from people we work with.